If you have worked as a system administrator at an enterprise, you might be familiar with Norton or Symantec Ghost, a great network-enabled system cloning solution. It allows you to create an image of a computer's hard drive and store it to a location on your network. If the computer in question has a failure you can restore it from the image and be back in business pretty quickly and easily. Although this may not always be a solution that small organizations use often, it is quite popular with larger ones. Symantec Ghost is a commercial software and comes with a pretty hefty price tag. However, there are several free alternatives for it in the open source world. Let's take a look at a few of my favorite ones. 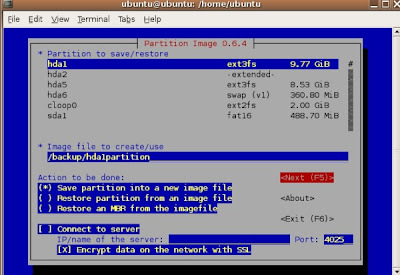 Partition Image supports most Linux and Windows file systems. It also has some useful features such as support for the compression of the snapshots using gzip and other common archiving formats, and allows you to split the snapshot into separate files to burn onto DVDs and CDs. It has support for the network. So you can configure a remote location on your network where Partition Image should copy the snapshot file or files. However, the thing that I found most appealing about Partition Image is that it is pretty smart. Most cloning software take a block level snapshot of your system. With Partition Image, however, if it finds an unused block it skips it. Thereby saving you a lot of space on your image. Another useful feature is that you can take snapshots of individual partitions as opposed to just the entire system. As an advanced Linux user this is great. You can take an image of the important partitions containing important system folders such as /etc, /var, and /home. This is particularly useful if you are planning to make some major changes to your server. For example, if you are planning on upgrading the Linux kernel on a server you can take a backup of the partitions that will be affected by the upgrade. If something goes wrong you can quickly revert those partitions from your backup. Another application for Partition Image is when you want to install several computers quickly. Install and configure one computer. Take a snapshot of it using Partition Image. Then you can create multiple clones of that computer using the image file. The only catch here is that all computers must have the similar hardware configuration. Partition Image, or Partimage, is available for download HERE. You can also get it using popular Linux distributions such as Ubuntu Linux using the application installer such as apt-get. It's very simple to setup and use and is highly recommended to power users who want an easy to use solution. PING, or "Partimage is not Ghost", takes a slightly different approach to Partition Image to the cloning process. PING comes in the form of a Live Linux CD. You can boot it using a CD, USB, or over the network. It has the standard set of features that you want in a cloning solution such as networking, the ability to write to Microsoft Windows shares, along with support for NFS, SSHS, and more. It also supports a great number of file systems and hardware. The fact that this is a bootable Live distro means that the creators of the project have bundled in a few cool features. For example, you can burn a CD or DVD of the image you create right from the distribution itself. You can also take a snapshot, format the drive, and restore the system right there and then. Another useful feature that PING has is the ability to back up the BIOS settings along with the system. PING can be downloaded HERE. Download it and burn it on a disc and you should be in business. Clonezilla is perhaps one of the most popular open source alternatives to Symantec Ghost. It comes in two editions - Clonezilla Live and Clonezilla Server Edition. The first is made for single system cloning, for backing up and restoring, while the second one is made for a bigger setup and for cloning multiple systems and simultaneous cloning of systems. Clonezilla is based on the DRBL technology, which means that it is so efficient that it can simultaneously clone multiple systems in a matter of minutes. In short, it's very efficient. The cloning process used in either edition of Clonezilla isn't that much greater than the other two options presented. It has the standard set of features such as support for many filesystems, support for dumping the image over the network, and image compression. The real advantage of Clonezilla is in the Server Edition. 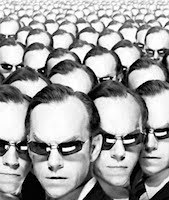 It is a robust, fast, and efficient cloning system. It is a perfect solution for enterprises that want to setup several systems with pretty much the click of a button. A few offshoots of the Clonezilla project have come up in recent times. For example, GParted-Clonezilla LiveCD is a live CD that boots off GRUB and gives you the ability to execute either GParted or Clonezilla. This makes it really useful when partitioning requirements also need to be done. That's what Gparted does. Another one is Clonezilla-SysRescCD, which is a multi-boot backup/restore and rescue CD that bundles Clonezilla Live Edition and System Rescue CD. The latter utility is a collection of system rescue and recovery tools. Clonezilla is also included in our list of free and open-source backup software for Linux. I have presented three fine open source alternatives to Symantec Ghost. Each one of these is very good at what they do. Depending upon your requirements, you can always choose the one that you find useful. Don’t forget to let us know via comment what your experience was. For what it is worth, partimage does not support ext4, so it of no use to most users of modern Linux distro's of the last few years. A CLI (command line) tool that can be used on ext4 partitions is fsarchiver. In my opinion FOG (free opensource ghost) is the best alternative, maybe the best in business. Our College has switched to FOG and imaged about 1000 Win7 PC's in a few weeks. Great Multicast, inventory, quick-image. Another program that's worth a look is g4u (http://www.feyrer.de/g4u/). g4u is excellent for cloning small numbers of PCs or moving data and operating systems between old and new hard drives. While Clonezilla has it's merits for single workstation Cloning and restores but Fog is the best hands down. Jun Auza completely missed the ball on Fog. am an old school. been using part image like nothing's better ever -- so if FOG is great, as commented, I'll skip fsarchiver and head straight to FOG. Thanks, Jun for this post and thanks to Anonymous for the tips. Any updates on this for 2013?